Basic forms of Brain Machine Interface (BMI) technology have already been utilized in the medical field for a number of years. This existing use focuses around the cochlear implant, a medical device which uses BMI technology to provide a sense of sound to a person who is deaf or severely hard of hearing. However, further applications in the medical field and in other areas -- such as an entertainment device, for use in industry, for integration with automobiles or as a control mechanism -- are becoming increasingly possible, as the science and research develops. According to the latest worldwide market study by Juniper Research, global hardware sales revenue from BMI will reach $19 billion per annum by 2027 -- that's up from an estimated $2.4 billion in 2018. BMIs bridge the gap between technology and the brain, interpreting brain signals for the purpose of interpretation or control. The study found that medical uses will account for 78 percent of shipment revenues by 2027. This will be due to development of advanced medical uses, such as artificial vision and prosthetic control. Juniper’s analyst examined the emerging market, analyzing metrics such as expected user impact, key barriers and ecosystem readiness. Juniper has identified three use cases with the highest potential: Concentration Monitoring, Cochlear Implants and Sleep Modification Tools. The research also found that the greatest impact of BMIs will be when used for concentration monitoring, where EEG (Electroencephalogram) technology can be leveraged to monitor fatigue. This is crucial for industrial businesses, which strive to improve safety and productivity. Juniper predicted that heavy industry will use EEG to replace more expensive existing monitoring systems. "EEG is more accurate than current wrist-based optical sensors for concentration monitoring, so adoption where concentration is crucial in high-risk environments is anticipated to be a big driver in the market," said Nick Maynard, research analyst at Juniper Research. 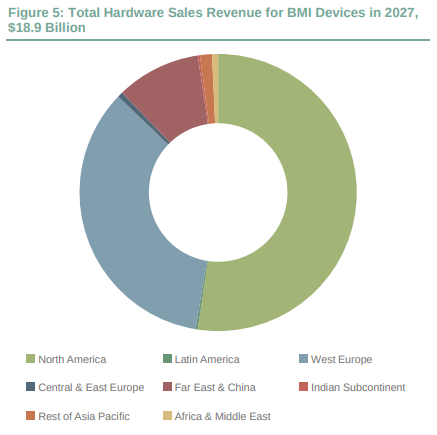 The research found that while shipments of BMI devices for consumer uses such as guided meditation account for a very low proportion of device shipments presently -- under 1 percent in 2018 -- the proportion will climb to over 6 percent of a much larger market in 2027. Juniper predicted that technology advancement in tandem with consumer virtual or mixed reality uptake would facilitate new interface paradigms when integrated. This higher proportion will be aided by the lower average sales price of these devices, just $270 in 2027, compared to $11,570 in the medical area.